Universal dimmer (RLC, LED, CFL) for flush mounting with one channel for up to 250W @230VAC (200W @110-125VAC). Auto load type detection (RLC). Configurable dimming curves for LED and CFL. It allows manual control of its outputs thanks to the push buttons on the cover. It includes 10 independent logical functions. 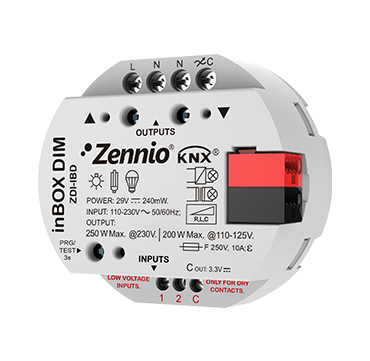 In addition, it incorporates 2 analog-digital inputs that may be configured as binary inputs for sensors and potential-free push buttons, as temperature probe inputs or as motion sensor inputs. Error detection: short circuit, voltage surge, overheating, anomalous frequency and supply voltage failure.